Am I a food writer or a food blogger? Or am I just a blogger who blogs about food? How about me being a food-lover who just happens to love baking and cooking and writing all about it? Having an identity that sticks with you everywhere you go can sometimes land you in amusing situations. Take for example a girl who said “hey! aren’t you that brownie girl? The one who has a blog!”. I find that very entertaining because then, soon after, the question I know will come next is, “so when can I try your brownies (insert other baked goods)?”. I just told a friend yesterday that alot of times, whenever I bump into a friend or an acquaintance, they never fail to remind me to bake a batch of brownies or cupcakes for them. So much so that alot of times I end up feeling guilty when I meet them next, and still have yet to pass them my sweet treats. Don’t be mistaken – I love baking/cooking for people… haha, just that I can’t help feeling bad when I haven’t got the time to feed them some love. Correct me if I’m wrong, but similar scenarios happen to most food bloggers. Known to be always on the prowl for delicious food, we are seen as a prime and rich source of information when it comes to food recommendations. Somehow when I look back at that faithful day more than 2 years ago when I first hit the “publish” buttonon this blog, I find it so unbelievable. To be able to produce something that people actually appreciate and to have total strangers telling me that I inspire them to bake and so on. I think then, that the effort is definitely worth it. The local food blogging community has also increased threefold over the past years and it is simply amazing when I attend makan sessions with these kindred spirits and end up chatting as if we’re old friends. The first food blogger lunch I attended was in 2005 at Mag’s Wine Kitchen. I fondly remember it to be a cosy do. There were not more than 20 of us at a table, enjoying good food and sharing cooking tips. They had one last year at Sage but I couldn’t make it, so this year, when June announced that it’ll be at Le Papillon on 1 September, I knew I couldn’t miss it. It was a perfect opportunity to catch up with my fellow food-loving friends and also, enjoy some well raved-about french cuisine. 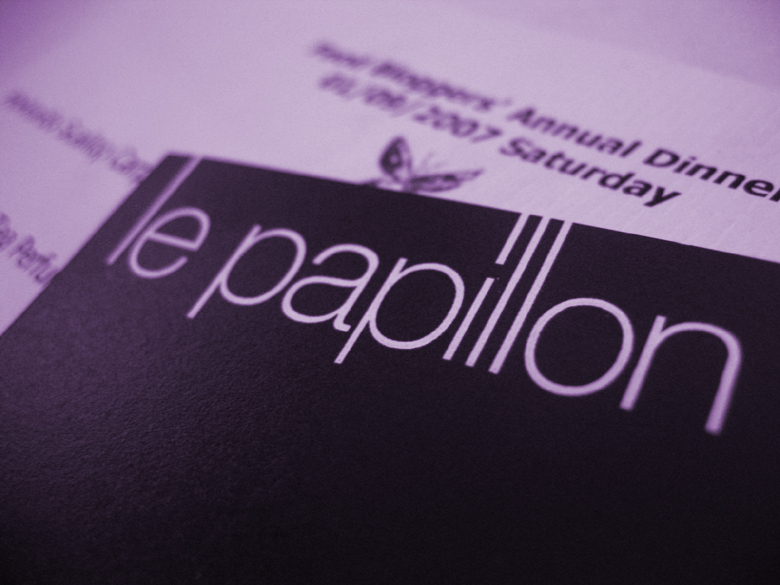 Held at Le Papillon, a cosy french restaurant at the Red Dot building, this dinner was something to talk about. Now, you know that I’m an undergrad with a tight budget so I hardly eat at places like this but I have heard good things about the food there so you can imagine my excitement when the day finally arrived. A whopping 31 people attended the dinner and mind you, it’s quite a huge amount, considering the size of the restaurant. 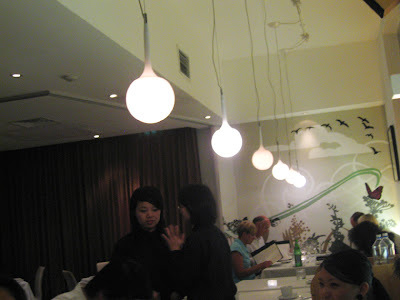 We occupied more than half of the space and I do feel sorry for the other diners who might have been perturbed by our incessant loud chatter (passionate foodies think nothing of stretching their vocal cords especially when it’s about that great dessert or char kway teow they sorely miss). 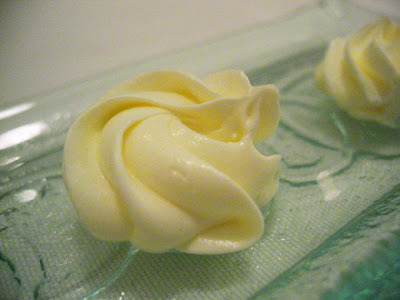 This is superb butter. I think it’s French butter. Pardon me, but I was kinda stupid at first – I thought it was meringue when they first served it. Haha, only when the fresh bread rolls came out then it finally dawned on me that it’s actually butter. It was so good that I asked for more bread (which was a good move.. you’ll know why later). 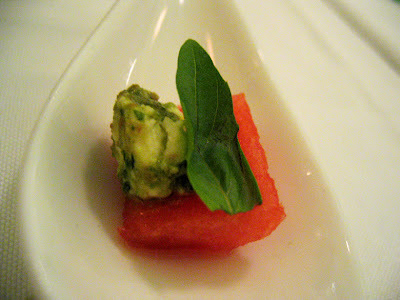 Before we started the meal proper, we were served this dainty serving of watermelon topped with feta (or goat’s – from what i read at their website) cheese and a basil leaf. I heard voices from the tables all round that they’re known for this. I knew why, the moment I put it in my mouth. Now I know why some places serve melon wrapped with proscuitto. The mix of sweet and salty brings about a good balance that brings the taste up several notches. I do believe that something that simple can be quite sublime as well. I honestly preferred the fish mousse – thought it was flavourful and went really well with the miso cream. I did read that those who had the beetroot (in place of the scallop due to dietary restrictions) thought it was nicer sans the scallop. Ahh, this one I loved. 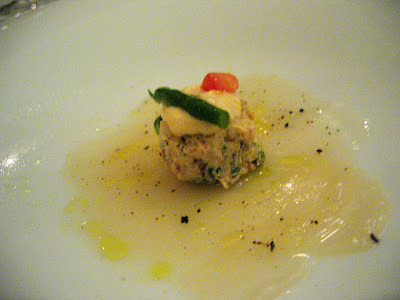 When I got the menu via email from June the night before the dinner, this jumped off the screen. 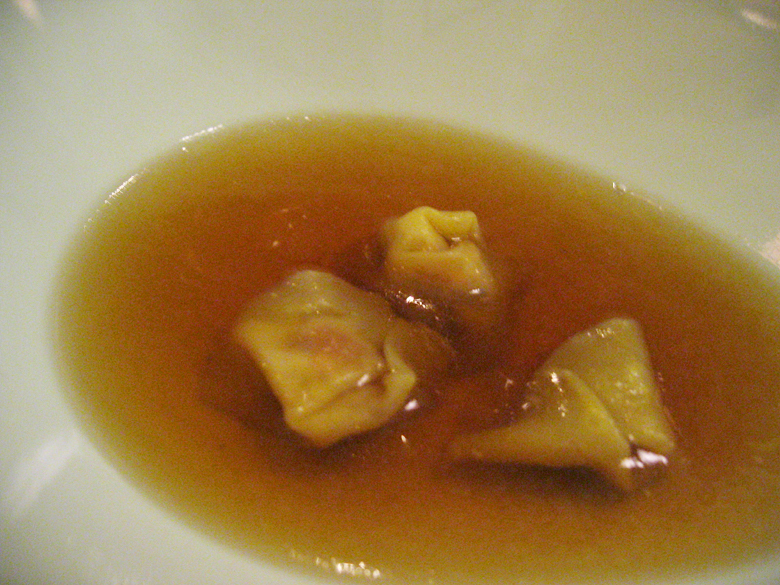 Foie gras tortellini just sounded so appetising. 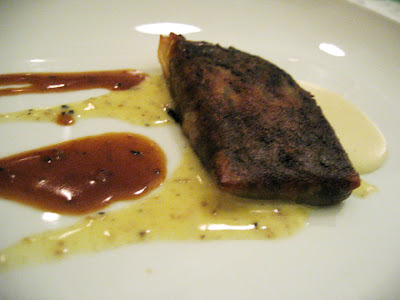 I seldom eat foie gras but my memories of it are all good. I just think it’s an innovative way to serve foie gras – anyway, this way, you use less of it (more geese spared!). Couldn’t quite taste the jasmine tea in the consomme though. Was really trying hard to concentrate on ‘finding’ it! hahaha but I loved it anyway. Bless the chef for his lovely idea of a herb-garlic butter crust. I am a huge fan of garlic and butter and I loved the rich blend of this on fresh mushrooms. Adored the different textures present. My only gripe was the non-existent argula salad or what constitutes it. Maybe it was for artistic purposes (perhaps the dish wouldn’t look as good if there was a heap of argula at one side?). I just thought that if it was stated salad, there would be at least 3 or 4 leaves? Okay okay, let’s not get bitchy here. 🙂 Just a slight observation. Loved the dish anyhow! it? 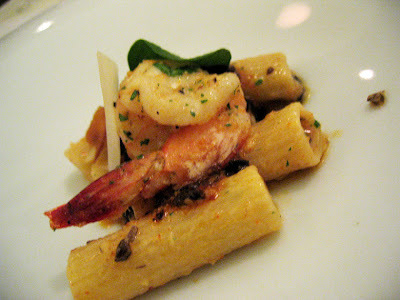 Anyway, I liked the pasta and the prawn. Super. Fish was oh-so-fresh that the flakes were kind of melting in my mouth. What an experience. Adored the saffron sauce, I think it went well with the fish. 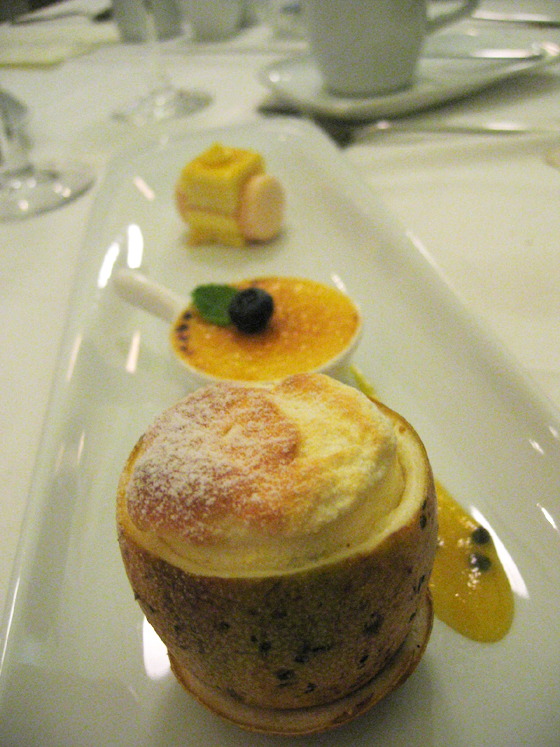 Before they served this, there was blood orange sorbet which was quite all right. Nothing memorable I guess. So anyway, this oxtail dish was fun to eat. I know, what a childish way to describe such a delicate dish ya? But it really was! I loved that it was wrapped a la parcel with phyllo pastry and totally dig the truffle butter – goes absolutely well with bread!! See I told you the bread came in handy. Delish! Truly amazing dinner I must say; it’s a treat for the senses. Check out the painted walls. It’s so dreamy and idyllic I think. If only I had walls like that in my room! This was an evening I enjoyed immensely and it did help that my table had some really fun and friendly people, most of whom I met for the first time – people like Denise of Hungry Hostelite and Ben of JiaLard. It was also lovely to hear Linda’s interesting culinary experiences at her workplace and culinary school. So there you have it, my summary of the evening. 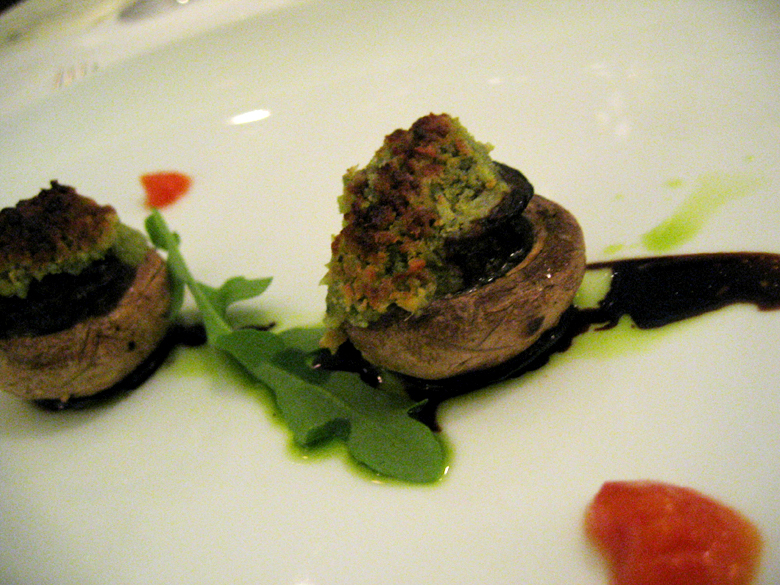 Do check out the rest of the foodblogs for more pictures and their take on the dinner. What an amazing-looking dinner. I’m especially intrigued by the oxtail–I’ve never had it before! 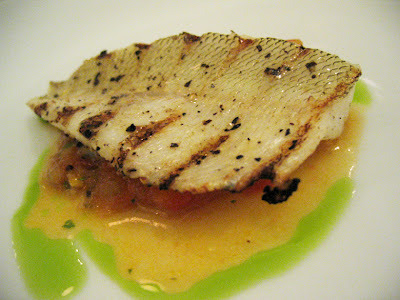 although i must shake my head; parmesan cheese in a fish dish? seafood is too delicate for cheese! food looks great though. arugala “salad” lol. in the USA, we call that garnish. 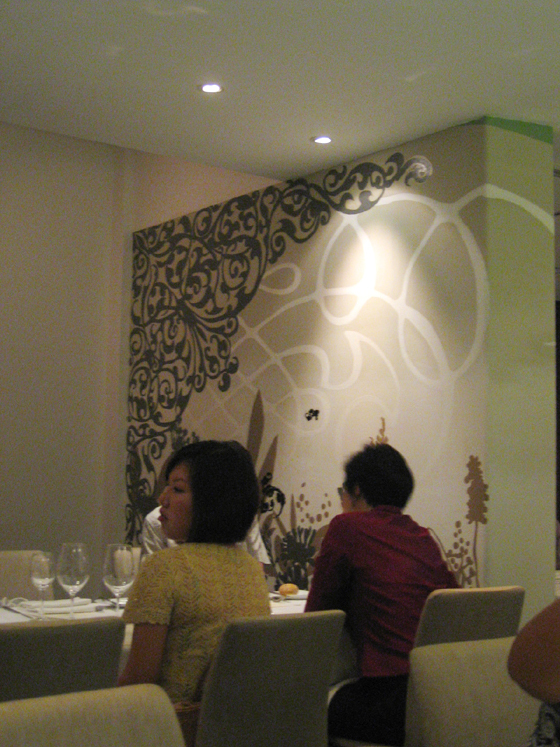 Hi Cheryl, nice having you sitting beside me and sorry for you having to entertain me throughout dinner.haha. Keep on posting despite the busy schooling schedule and a very nice writeup….especially the arugula salad part. Wow. 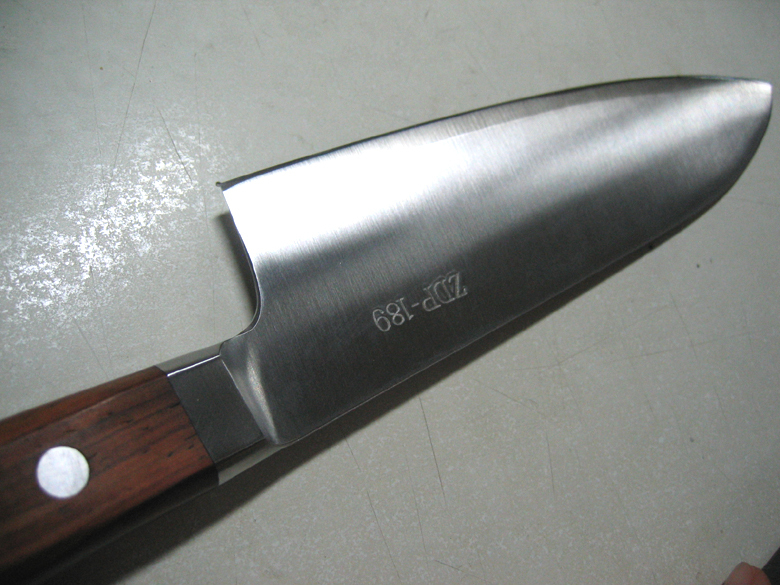 Great knife. Congrats. Dinner looked great. Sorry I was out of town and missed it.